Posted on 8, August 2016 by EuropaWire PR Editors | This entry was posted in Automotive, Business, Germany and tagged Albert Mayer, Audi, Peter Mosch, Production jubilee for Audi Q5. Bookmark the permalink. 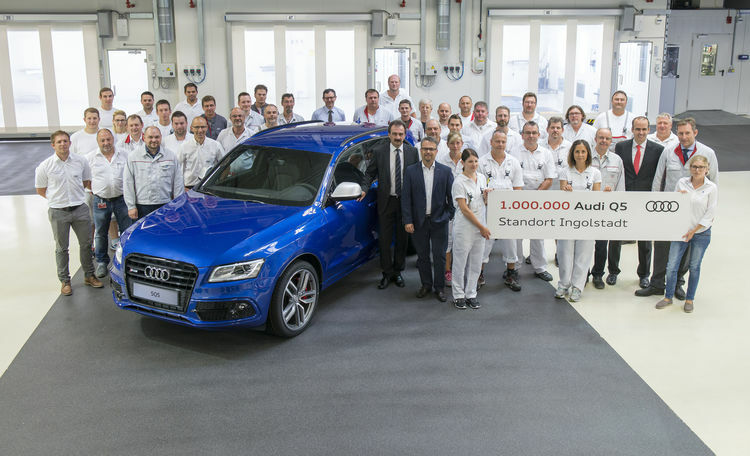 A production milestone has been reached at the Audi plant in Ingolstadt: The millionth Audi Q5 drove off the assembly line at Audi’s main plant in Ingolstadt. Employees and management are pleased about the SUV-models’ international success. Picture: Plant Director Albert Mayer (front right next to the anniversary car) and Chairman of Audi’s General Works Council Peter Mosch (on Mr Mayer’s right) with A4/A5/Q5 production employees. INGOLSTADT, 08-Aug-2016 — /EuropaWire/ — This Thursday (08/06/16), the one-millionth Audi Q5 drove off the production line at Audi’s main plant in Ingolstadt. The jubilee car, an SQ5 in Sepang Blue, will be delivered to a family in Germany. The international success of the Audi Q5 began in 2008, when Audi launched this model in the segment of mid-range SUVs – the second Q-model from the brand with the Four Rings after the Audi Q7. Since then, the Audi Q5 has developed into a favorite with the customers and is to be seen on the roads of more than 100 countries. Because Audi produces this top-seller also in China and India for the respective local markets, worldwide deliveries sum up to nearly 1.6 million vehicles. The company handed over a total of 266,968 Audi Q5 cars to its customers worldwide last year, which is about eight percent more than in 2014 (247,446). The success of the Audi Q5 is steadily continuing, with a further increase in unit sales of 4.7 percent in the first half of this year. The Audi Q5 continues to be the bestselling premium SUV in its segment. Audi employees in Ingolstadt build more than 650 automobiles of this model every day. In addition, the Audi Group produces this top-seller also in Changchun, China, and Aurangabad, India, for the respective local markets. Altogether, nearly 1.6 million of the Audi Q5 have been sold worldwide since the start of production in 2008. The SUV is especially popular in China, the United States and Germany.